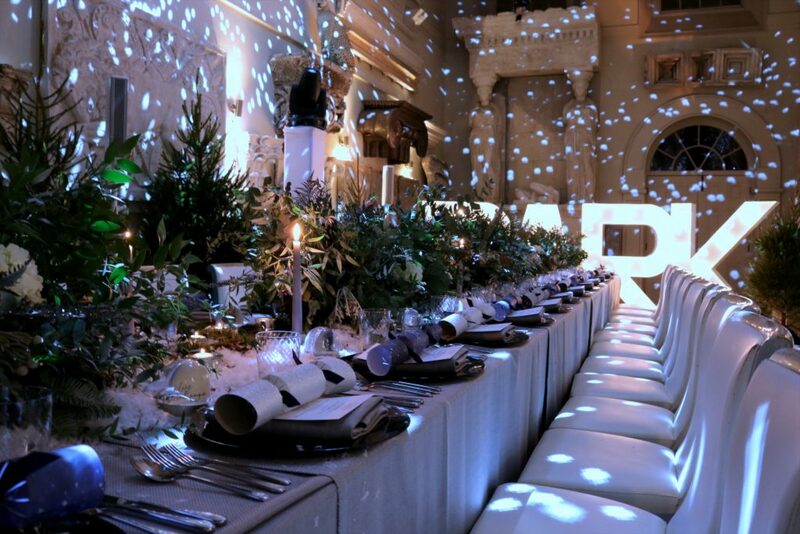 A winter wonderland theme is one of my favourites, as I love to create a immersive experience for the guest – Whether it’s transporting them to another world or just giving them an experience they haven’t had before. 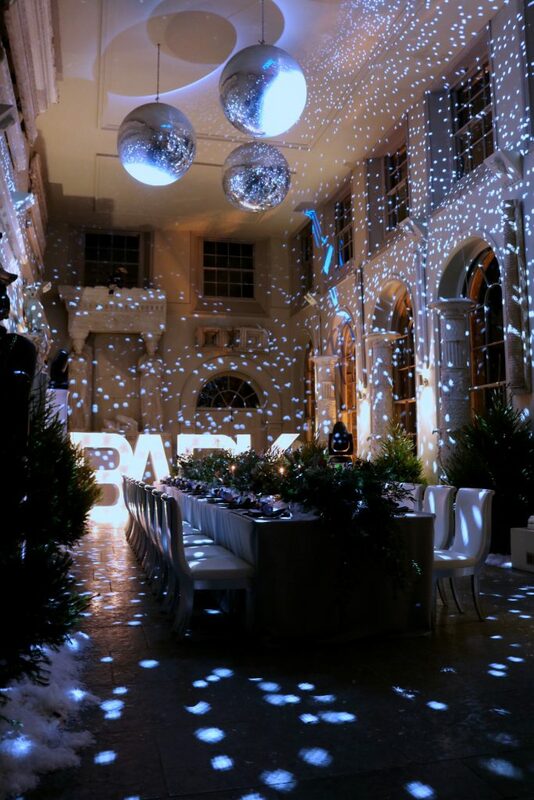 As the doors opened to this winter wonderland guests walked the steps up to the Orangery, snow on the floor and leaves crunching underfoot. For last week’s event for bark.com , the room was lined with christmas trees to make it feel like the guests were dining in a wintery forest. 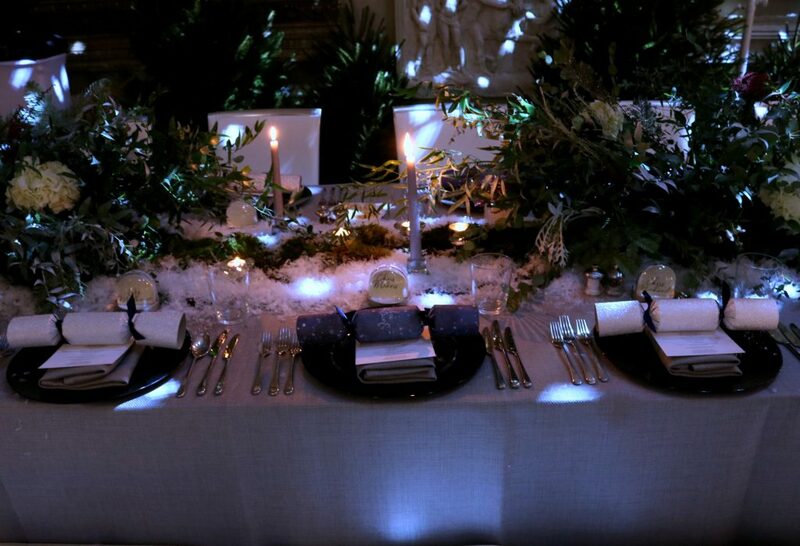 The idea for the tablescape came from wanting to create something tactile and real – the centre of the table overgrowing with foliage, moss and piled with snow…. just as you would imagine a wintery forest floor. 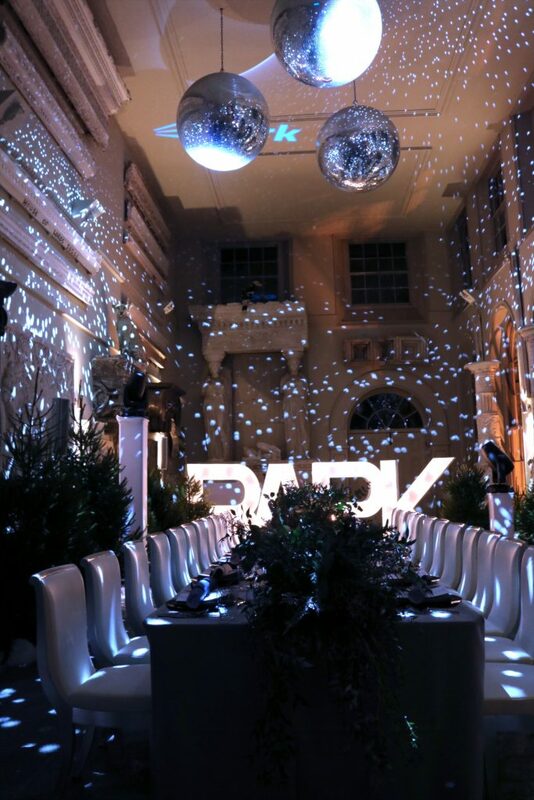 Every table should have a charger – or some sort of centrepiece – a place ‘setting’ whether it be a charger or decorative plate or something befitting of the theme. For this we laid napkins flat on the charger in a simple fold and placed the menu directly on top, finished with a in brand coloured luxury cracker. To complete the winter wonderland theme I used snow globes for place names. -Sometimes it is hard when you are squeezing everyone around the table at Christmas but try to make each place setting around 50cm wide so that people have plenty of room. -When making your table plan – avoid placing couples next to each other and where possible make settings alternate genders. -The table should have some decoration on – even if it is something simple, like candles. Although, when doing your table decoration make sure that your centrepieces don’t block your guests view across the table. -Have suitable music playing quietly in the background. -Make sure you have everything on the table you need for the meal. -Always have a bottle of white and red wine on the go for your guests to have which ever they desire. Also something interesting for non – alcoholic guests – a lightly bubbled juice or a fruity cocktail mix. -Always ask for help when you need it – If you are stressed, this will rub off on your guests – especially at Christmas when it should feel like everyone is mucking in!! -If you have young children – plan to serve them a slightly before adults – so that you and your guests can enjoy the meal without restless children. To help with the restlessness give children activities to do whilst you eat – a little bag of activities like colouring and a couple of newly unwrapped toys!